By paleoaerie in Book reviews, Reviews on September 18, 2015 . 1stly, many many thanks for writing this review. As implied by my FB comment, it’s MUCH more than I ever expected. I’m especially glad that I wrote my review 1st, otherwise I would’ve taken forever figuring out how to write something semi-decent & original about this book (which is often the case when reviewing books already reviewed by MUCH better writers). 2ndly, w/all due respect, I think you were a bit too hard on some of the hypotheses presented in this book (although I understand why). Specifically, I’m referring to “the discussion of neck posture in sauropods” & “the chewing cycle of hadrosaurs”. Yes, they’ve gotten more complex since 2006, but they’re still valid based on what I’ve read (E.g. The highlighted parts in the following links). 3rdly, I’m curious what you think my review & whether its analogies accurately describe this book: A more family-friendly version of Sampson’s Dinosaur Odyssey: Fossil Threads in the Web of Life; The “Dinosaurs: Ancient Fossils, New Discoveries” exhibition in book form ( http://www.amnh.org/exhibitions/past-exhibitions/dinosaurs-ancient-fossils-new-discoveries ). I think they do, but wanted a 2nd opinion. 4thly, would you agree that this book in general & Chapter 8 in particular makes a good case for why dinos are important today? I think it does, but wanted a 2nd opinion. Lastly, is the cover of your copy different from the 1 in the 1st picture? I ask b/c the inside flaps in the 4th picture look different from those of my copy. Glad you liked the review. It’s a good book and deserves to be in dinosaur book collections. Thanks for recommending the book to me. In regards to neck posture in sauropods, it is true that there are paleontologists who continue to support these views, but not as many as did then, I think for very good reason. The study of Stevens and Parrish (1999), while widely accepted when it came out, has some anatomical issues making their conclusions inaccurate. 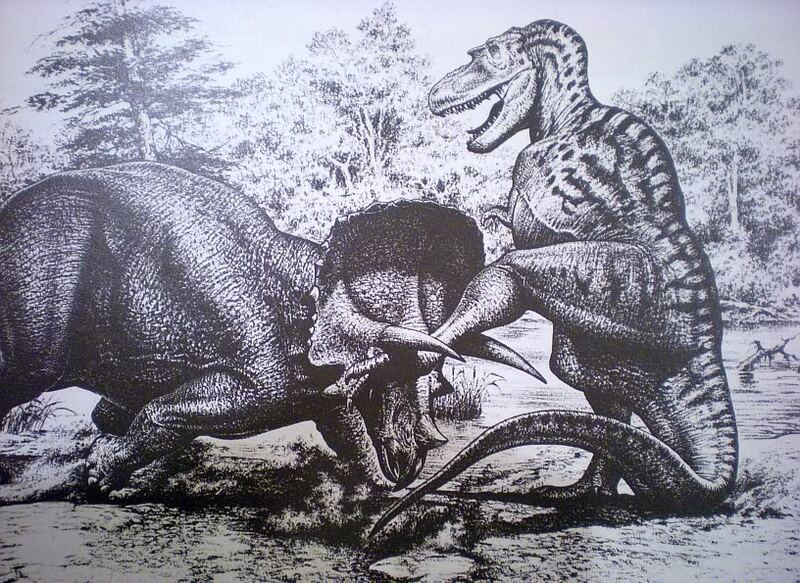 Therefore, any discussion of neck posture in sauropods is lacking without mention of those problems. Have you read the work of Tayler, Wedel, and Naish? I meant to put this link in the review, so this is a fine time to include it. I think they do a fine job of demonstrating many of the reasons why it is likely that sauropods had more diverse neck postures than envisioned by many who have followed the Stevens and Parrish study. Gardom and Milner spare only one sentence on high grazers like brachiosaurids, so it seemed to me that the discussion was somewhat unbalanced in that regard. The pleurokinetic nature hadrosaurid skulls is still accepted by some, but after seeing the work of Holliday, that view is becoming less well accepted. Of course, Casey and I worked in the same lab getting our doctorates, so I am biased in this view, I am sure. Nevertheless, while I at one time found the purportedly highly mobile skulls of the hadrosaurs to be a great hypothesis, the more I learned about anatomy the less likely I found it. If they had any degree of pleurokinesis, it was much less than is commonly presumed. I think this is one place where the coolness of the idea has encouraged people to exaggerate its effectiveness. I think the comparison with Sampson’s book quite valid, an astute observation. I quite like the tact both books take and they do a great job. There is less text and more illustrations in the Gardom and Milner book, making it more accessible for more people at younger grades. Sampson’s book will provide more meat to those wanting more after reading this book. The AMNH exhibit is also quite well aligned with the book, good catch. I think your review is quite good and I agree about the artwork. Sibbick is an excellent artist, but the illustrations in this book are getting rather dated. 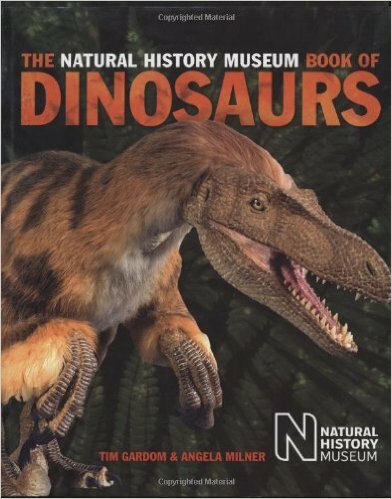 I just noticed while writing this that the dromaeosaur on the cover had the broken wristed “bunny” hands so often drawn on dinosaurs, but which we know to be wrong. Not so sure the book really brings out why dinosaurs are important today, at least not explicitly, although it does show well that they are important. I do think it shows that our view of the world and the boundaries of living creatures, if limited by only what we see today, would be very myopic compared to our view after seeing just how far life has gone in the history of the planet. The books also portray science as dynamic and changeable as new data is always being incorporated, expanding or changing what we think we know, which is a good lesson for readers, considering that too many people view scientists as either knowing everything or nothing, a rather silly dichotomy in my opinion, but common nonetheless. I particularly like the picture comparing reproductions of Iguanodon by Waterhouse Hawkins for the Crystal Palace in 1853 to the 1940s versions to the more modern semi-bipedal stance. So in this sense at least, the book does an excellent job of showing the importance of dinosaurs to today. The image on the pages in the fourth picture are the same as in my copy, but I hadn’t noticed the book flaps are indeed different. The image was taken from the Amazon images for the book and I didn’t realize that particular image is from the 1993 book, not the 2006 copy. If the Sibbick images are carryovers from the 1993 edition, that would explain the dated look of some of them. As always, many thanks for getting back to me. Also, many thanks for confirming the validity of my review’s analogies. I like that picture too. I asked about Chapter 8 b/c it starts w/the question, “Why are people so interested in dinosaurs?”, & then seems to answer that question by showing how important dinos are today. “AN ENDLESS ATTRACTION” in particular seems to sum up what you said in your answer to my question (E.g. 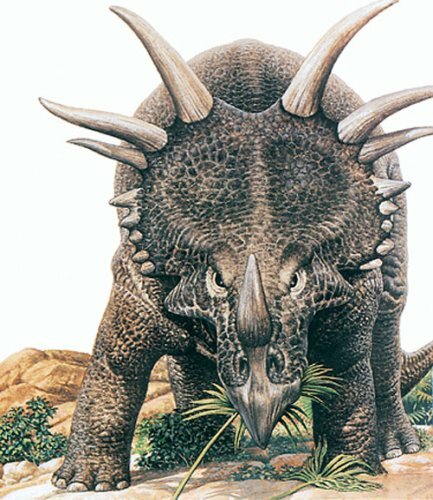 “Every new fossil find has the potential to challenge the accepted wisdom about a dinosaur species or even dinosaurs in general. What if fossilized skin were found with the colour somehow preserved? What if a family of Tyrannosaurus hatchlings was discovered? Or evidence of even larger sauropods than Argentinosaurus? Anyone could make such a find. Amateur fossil collectors are the eyes and hands of dinosaur scientists around the world. 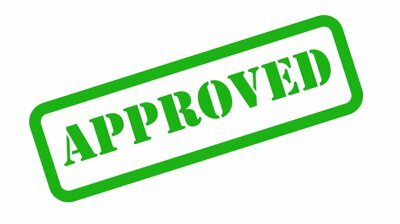 No other branch on science offers such a potential opportunity for non-experts to participate or such exciting rewards for doing so”). You make an excellent point. Paleontology is unusually amenable to important contributions by amateurs making it a great gateway to experiencing science. Hope you don’t mind me commenting on an older post. I just wanted to get back to you about a few related things. 1stly, have you read Norell et al.’s “Discovering Dinosaurs: Evolution, Extinction, and the Lessons of Prehistory, Expanded and Updated” ( http://www.amazon.com/Discovering-Dinosaurs-Evolution-Extinction-Prehistory/dp/0520225015 )? I ask b/c Q&A #50 (“How does dinosaur study benefit modern humans?”) refers to Q&A #3 (“Why are dinosaur fossils so interesting?”), both of which seem similar to “AN ENDLESS ATTRACTION”. I wanted to make sure that it wasn’t just me, hence why I originally asked about Chapter 8. 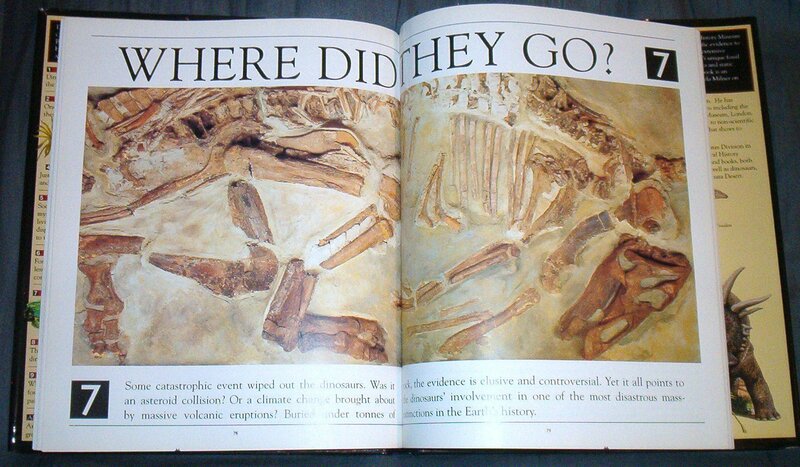 2ndly, some good news: To quote Barrett ( http://newviewsonoldbones.blogspot.com/2015/12/farewell-2015.html ), “Another major push at public outreach was the completion of a new official NHM dinosaur book, which I co-authored with Darren Naish: Darren did most of the heavy lifting, however, and deserves the lion’s share of the credit. This new title should hit the bookshelves in the next couple of months and will boast some new artworks by Bob Nicholls.” Given that my #1 all-time favorite book is a NHM dino book, this is very exciting for me! I remember seeing Norell’s book and flipping through it, but I haven’t really read it and honestly don’t remember much about it. I will have to go back and look at it more closely. That is excellent news about Barrett’s book! Both Barrett and Naish write well and are extremely knowledgeable, so I am sure the book will be excellent. Glad to hear the NHM is working on that. I visited the museum once and remember well the congestion of which they speak, which is a shame because they have some fantastic mounts. Well worth the frustrations. Thanks for the reminder. The recommendations have been sadly neglected and I plan on working on them more in the next couple of months. I’d better, as I am planning on giving a talk about that very topic at the beginning of April. Will there be a post about that? Hope so b/c it sounds interesting & I’d like to know more about it. There should be. I have several things like that I need to get up on the website.